I, Florence Emma Quint, was born o a farm near Beloit in Mitchell County, Kansas on August 23, 1888. My folks lived there until 1902, when my father decided to move near Hill City, Kansas. So, on May 5 we arrived in Graham County where I have lived ever since. We came out in a covered wagon, me driving the team of horses with mother, Clara, Grace, Elmer and Hazel. It took us five days, camping each night. My father brought quite a herd of cattle so we would have to corral them each night. Clarence helped drive the cattle, Jennie and Mabel stayed on the farm in Mitchell County until after harvest. Mabel and I stayed in Hill City that fall and attended school. At seventeen I began teaching - finished out a two months term i the sprig of 1905 at Pleasant Home before getting my teaching certificate. I got my teaching certificate that summer then taught the following winter at the same place. I taught ten terms then on August 31, 1916, I married Arthur Morris and settled on the farm seven miles southeast of Hill City. Then in 1944 Arthur suffered a paralytic stroke. 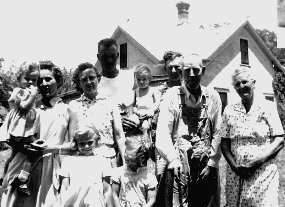 We stayed on the farm until 1948 when we moved into Hill City. We enjoyed our farm life greatly. Raised two girls, Vera and Avis and were a happy family at that time. We worked hard, but had time for pleasures. Leon Fink behind Arthur. At Elmer Quint's farm. 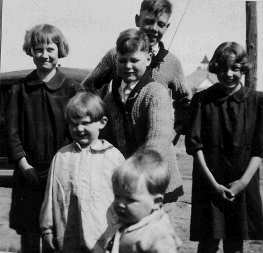 Some of my nieces and nephews spent several summers with us. We had a croquet ground which we enjoyed the game of croquet of evenings after our day's work was done. Since living in Hill City (506 W. Elm), I busy myself in doing things for my grandchildren which is a great pleasure. I think it would be well to add a little to what Florence has written, for I think she is a little too modest. Florence, Arthur and girls were always jolly and ready for a good time. Her house was always open for parties and company whenever anyone wished to visit. The nieces and nephews looked forward to spending their summer vacation with them out on the farm; being 'city kids' this was quite a treat for them. Our sons enjoyed their trips to the farm, and one time when Robert was playing cowboy, he lassoed one of Florence's turkeys which surprised him as much as it did Florence. Needless to say, she had to rescue the turkey! At one time, when Vera was about four years old, Florence kept Uncle Jim, who had almost lost his eyesight, for a couple of weeks while Mother and Father went to Illinois after the death of her sister. Vera would help Uncle Jim find his way around. She would also call the turkeys when feeding time came and Uncle Jim enjoyed being around her. He remarked to Florence one day, "That's the smartest child I ever saw. She doesn't need to go to school." Our sister, Clara, always had a 'green thumb', but I think Florence always had a 'helping hand'. She was always willing to do for others and for years would always make at least one visit a week to our parents home, helping with the work whenever Mother needed help. Viva, Florence Morris, and 2 nieces, Jean Wilkins, and Lela Ferguson. When her granddaughters needed help, she would drive the seven miles from Hill City to the farm nearly every day doing things that needed to be done. Mother used to say, "Florence always worries for fear she will run out of something to do." That has never happened!